Did you know websites with a blog receive 434 percent more indexed web pages compared with websites without a blog? If you want your website to rank high on search engines, creating a blog is a great place to start. However, starting a blog can also feel like you're designing a website from scratch. Not to worry. In this article, we'll reveal how to get your blog up and running quickly with these simple tips going forward. Let's go! You might be panicking already cause you can't come up with an interesting, catchy and awesome blog name on the spot. Remember, this is your brand name which needs to be relevant to the topics you're expecting to cover in your posts. But also, you can always change your blog name later if you change your mind. If you're really struggling, then choose your name or nickname. For example, sillyharry.com. You need your blog name to stay simple and to the point. You want to appeal to your audience, while also considering how the name appears to search engines. So always include SEO keywords. Once you're ready with your blog name and domain name, it's time to register with a hosting provider. This ensures your data files are accessible and secure. You can take advantage of free hosting providers. However, they always come with risks and low-quality services. Alternatively, you can go with one of the many hosting providers which charge a subscription fee. These can usually save you money along the way by providing you with better website design, too. You can discover more and compare the different hosting provider options available for your blog. 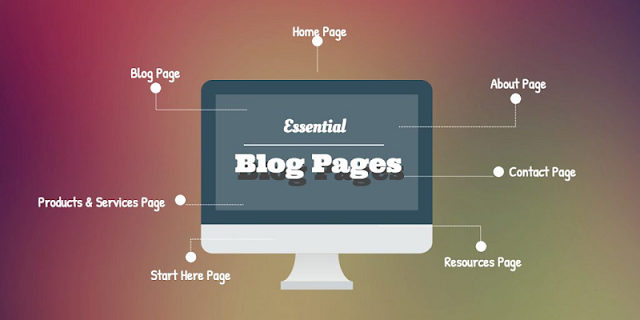 You need to select a blog platform to write your articles and design a website from scratch. This is called a CMS (Content Management System). A Content Management System (or CMS) is where you'll be writing, designing, and publishing your blog posts. You should be able to upload content here and select themes for your blog. 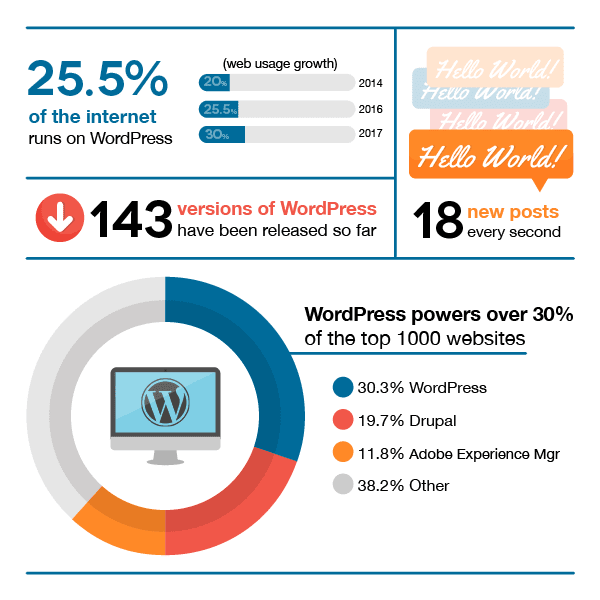 There are tons of blog platforms from Wordpress to Squarespace. You need to choose which is right for you. Your best chance of becoming a successful blogger is to establish yourself as an influencer in your niche. You need to write about something you're already passionate about. But that's not enough either. You also need to know your stuff! Research what your audience would actually be interesting in reading about. The more interesting your blog to your readers, the more effective you'll be at driving web traffic to your website. 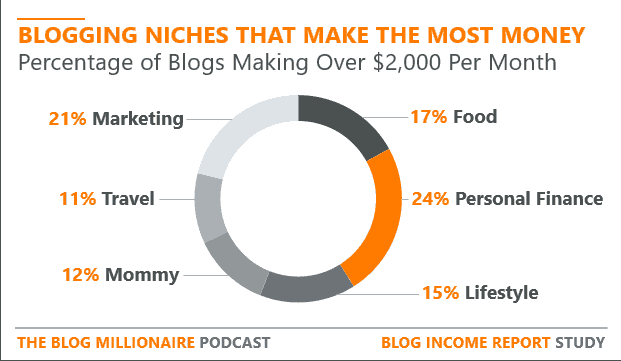 You can check most profitable blog niches to get some ideas. It doesn't matter what your content is about if you can't get your audience to stick around long enough to read anything. Attention web designers - you've got 50 milliseconds to make a good impression with your website. You need to instantly connect your audience on an emotional level. This requires an awesome blog design which draws you into reading the content. That's not just about the aesthetics of the blog web pages either. While this is important, it's not everything. It's also got to be easy to navigate around the web pages. 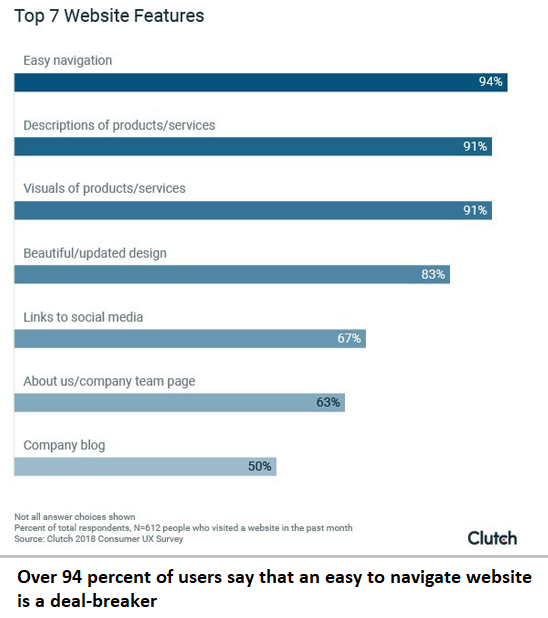 Over 94 percent of users say that an easy to navigate website is a deal-breaker. Users want your website to be intuitive to browse. They shouldn't have to second-guess each click. It needs to be obvious how it works. You've got to remember the boring bits of your blog website, too. It's not only about fascinating blog posts and intriguing design. You also need to include the essential web pages, such as "About Us/Me," "Contact Page" and also, "Store/Shop". Your "About Me" page should focus on who you are and why you're writing this blog. Talk about your background (why your opinion matters?) and what's your motivation (why you want to help?) to build authority. Your "Contact Page" should simply include a basic email address and social media accounts. You can also include an option to call via telephone. You could also include a message box to encourage interaction. It's important to establish a strategy to connect with your audience. First, consider what you want to achieve with your blog. Do you want to drive web traffic to your online store? Or, do you want to build your authority? Make sure you learn who your audience actually is. You can discover information via Google Analytics and other tools. Knowing the location and demographics of your audience is important for engaging with them more effectively. Your audience doesn't want to read a one-off blog post without ever hearing from you again. You need to show that you're reliable with a regular blog post. Tell your readers that you're going to post every week or bi-weekly to maintain enthusiasm for your blog activity. Keep yourself organized to make sure you meet this commitment to maintain trust. Your audience doesn't just check into your blog for the words. You could also add videos to your blog to spice things up. Your audience also wants images! 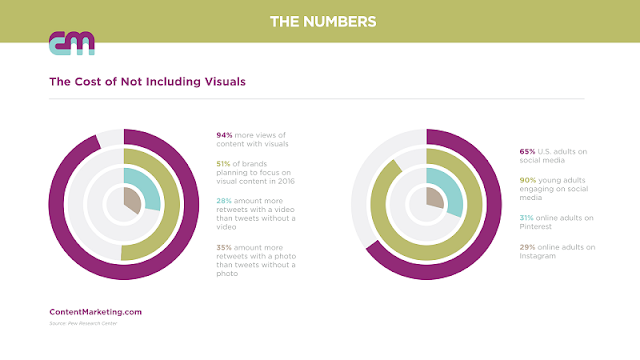 In fact, blogs with images receive 94 percent more views than those without images. It's not as simple as "write the blog and they will come". You need to go out there and promote your blog yourself. The best tools at your disposal are definitely social media networks. Whenever you publish a blog post, post it on Facebook and tweet about it Twitter. This is a sure-fire way to build your audience for your blog articles. 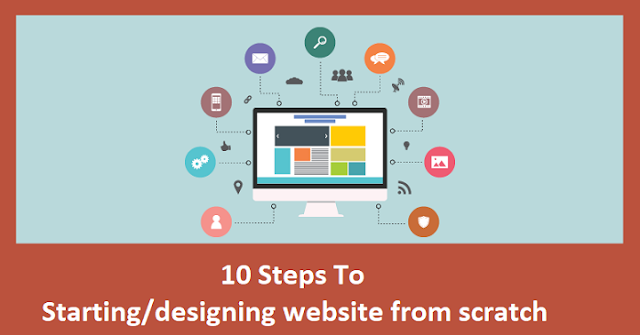 Now you know the tricks of designing a website from scratch to make a blogging success. Starting a blog can appear a lot of work at first. However, breaking it down to 10 steps makes it much easier to get going. If you want to learn more about how you can make your blogging website successful, check out our consulting services here.